Received: December 5, 2018; Accepted: December 6, 2018; Published online: December 30, 2018. High fluence diode lasers have emerged as the gold standard for removal of unwanted hair. Lowering the energy should result in less pain but could theoretically affect the efficacy of the therapy. The author designed this study to compare the efficacy of a low fluence 808-nm diode laser to that of a high fluence 808-nm diode laser for permanent hair removal in Korean women. The author classified 26 Korean women into 2 groups. The groups received laser treatment for either the forearm or the lower leg using a low fluence HR808 prototype diode laser on one side and a high fluence laser on the other side at 1-month intervals. Hair counts and thickness were recorded by folliscope and photograph at each follow-up visit and at the 3-month follow-up after the final laser treatment. At the final visit, patients were surveyed regarding pain and satisfaction. Three plastic surgeons assessed the results by photograph. In the forearm group, the median reduction of hair density was 14.4% with low fluence and 19.0% with high fluence. The hair thickness reduction rate was 50% with low fluence and 65.6% with high fluence. Pain scores were 1.91 and 2.1, respectively. In the lower leg group, the median reduction of hair density was 45.9% with low fluence and 63.7% with high fluence. The hair thickness reduction rate was 57.7% with low fluence and 60.7% with high fluence. Pain scores were 2 and 2.4, respectively. High fluence HR808 prototype diode laser can efficiently remove unwanted hair. In terms of treatment comfort, there was no significant difference compared to low fluence mode. Excess or unwanted hair growth remains a treatment challenge and considerable resources are spent achieving a hair-free appearance. There are many traditional treatments. For example, plucking, chemical depilatories, shaving, waxing, and electrolysis. But they are not considered ideal method. These methods can be inconvenient and most only produce short-term improvement. Laser hair removal have become one of the most common noninvasive cosmetic procedures performed in plastic surgery and dermatology because they are proven to be efficient methods for permanent hair removal. Commonly used lasers and light sources include long-pulsed neodymium (Nd):yttrium-aluminum-garnet (YAG) laser (1,064 nm), diode laser systems (800 nm), alexandrite laser (755 nm), ruby laser (694 nm), and intense pulsed light (IPL) source. In the peer-reviewed literature, the diode laser systems have emerged as the most effective hair removal method.1 Current laser treatments rely on the technique of selective photothermolysis. The goal of which is to target a defined structure using a particular wavelength of light delivered in or about the time that the target structure loses 50% of its heat, also known as the thermal relaxation time. The energy absorbed selectively heats the target while allowing the surrounding area to remain relatively untouched. In laser hair removal, melanin in the hair shaft is the target chromophore, whence heat is transferred to the associated stem cells and follicular bulb.2 While many wavelengths can target melanin, this study uses 808nm diode lasers. They are currently considered amongst the most effective lasers for hair removal. We compared two methods of delivery; low fluence and high fluence. A previous study histologically demonstrated that repetitive low fluence laser devices do indeed induce necrosis of the hair follicle. The purpose of this study is comparative evaluation of forearm and lower leg hair removal using different fluences 808-nm diode laser. This is a prospective single-center, bilaterally paired-, randomized-comparison study. Twenty six female volunteers were recruited from the hospital staff and the outpatient clinics of the Department of plastic and reconstructive surgery of sooncheonhyang bucheon hospital, Korea from July 2017 through April 2018. And they were divided into two groups; forearm treatment group and lower leg treatment group. The study enrolled patients who met eligibility criteria. Inclusion criteria were as follows: Aged between 20 and 55 years, willing to abstain from use of any additional hair removal treatment during the duration of the study, and willing and able to comply with all study requirements. Exclusion criteria included: patients under 18 years of age; active localized or systemic infections; history of acne scarring or herpes simplex virus in the treatment area; photosensitivity or allergy; use of the following drugs: minoxidil, finasteride, isotretinoin, steroids, photosensitizing medications. In Addition; skin pigmentation disorders, Hailey-Hailey disease, Darier’s disease, ichthyosis, vitiligo, inverse psoriasis; pregnancy and lactate women; subjects with tattoos, chronic daylight exposure, tanning; received laser hair removal treatment for the forearm and lower leg (within 12 weeks). At first visit, hair counts per cm2 was performed on both forearms and lower legs to indicate the baseline values pretreatment. Then all of the areas were treated in four sessions, with a gap of one month between each session. In each patient 2 × 2 cm area at baseline was determined for counting the number of hair. The ratio between the number of hairs before and after laser treatment was calculated. 808-nm Diode laser system (HR808 prototype diode laserTM; Wontech, Daejeon, Korea) was used in this study. Pre-cooled water-based lubricating gel was applied before treatment for epidermal protection as a heat sink. The treatment areas were routinely cleansed and hairs were trimmed to a uniform length of 2–3 mm using a safety scissors. Patients were treated with a low fluence mode (12 J/cm2) on the right forearm or lower leg and a high fluence mode (14 J/cm2) on the left forearm or lower leg. Laser pulses (30 milliseconds) were given with five to ten passes. Laser pulses were emitted at a fixed rate of 7 Hz. The mean time interval between successive pulses over any given area was 1–2 seconds. The clinical endpoint of treatment was the presence of slight perifollicular erythema. After each treatment session, digital photographs (Nikon D750; Nikon Corp., Tokyo, Japan) were taken of the subject’s forearm and lower extremities prior to the laser treatment in photographic room. Each photo was taken maintaining positioning, camera settings and identical ambient lighting. And the density and thickness of the hair were assessed through visual and Folliscope equipment (Fig. 1). The results were evaluated three months after completing the final session. The intensity of pain was subjectively expressed by each patient and recorded respectively after the each treatment, by visual analogue scale (VAS) with a range from 0 (no pain) to 10 (unbearable pain). Therapeutic outcomes were assessed by patient satisfaction of treatment results. That was evaluated using the following 4 point grading scale. At the seven-month (Visit #6) follow-up visit, all subjects reported excellent (3), very good (2), good (1), and fair (0) satisfaction with their outcome. Independent clinical assessments of the treatment areas were conducted by three plastic surgeons blinded to the study subjects based on comparative photographs using the 5 point grading scale: 0 = no change; 1 = slight improvement (1–25%); 2 = moderate improvement (26–50%); 3 = significant improvement (51–75%); and 4 = excellent improvement (>75%). The median value of the three scores in each patient was determined to be the final score of the physicians’ assessment. The study was designed in compliance with the ethical principles of the Declaration of Helsinki. The trial was approved by the institutional ethics committee. SPSS 14.0 (SPSS Inc., Chicago, Illinois, USA) was used for statistical analysis. Paired t-test or Wilcoxon’s signed rank test (95% confidence interval)were used to measure the variations between baseline and at one month after treatment. McNemar’s test (McNezmar-Bowker’s test if 2 × 2 or higher) was performed to compare changes in categorical variables before and after treatment. Statistical significance was considered to be p < 0.05. The study population comprised 26 subjects who visited for forearm and lower leg hair removal. A total of 26 female patients completed the study (13 subjects with forearm hair removal and 13 subjects with lower leg hair removal), average age of 29.7 years with a range of 24 to 38 years and 35.2 years with a range of 25 to 51 years. After the end of treatments, all the patients in both groups were satisfied and noticed a long-term hair reduction. In forearm group, based on hair density at the baseline (prior to the treatment) and at the visit #6, the means of hair follicle thickness reduction on the low fluence side were 50% and high fluence side were 65.6%, respectively. The means of hair follicle density reduction on the low fluence side were 14.4% and high fluence side were 19.0%, respectively (Tables 1, 2). Comparably, the mean VAS pain scores with the high fluence (2.1) were slightly higher than that with the low fluence (1.91). Plastic surgeon’s assessment score was 3.15 on high fluence side, and 2.84 on low fluence side. In lower leg group, the means of hair follicle thickness reduction on the low fluence side were 57.7 % and high fluence side were 60.7%, respectively. The means of hair follicle density reduction on the low fluence side were 45.9% and high fluence side were 63.7%, respectively (Tables 3, 4). Comparably, the mean VAS pain scores with the high fluence (2.4) were higher than that with the low fluence (2). Plastic surgeon’s assessment score was 3.54 on high fluence side, and 3.00 on low fluence side. Patient’s satisfaction survey results were marked in Fig. 2. The percentage of ‘Excellent’ were higher in lower leg. In both site, the percentage of ‘Excellent’ were higher in high fluence group. There was no statistically significant difference (p < 0.05) between the high fluence and the low fluence. The treatments were tolerated well without anesthesia. The majority of patients appealed slightly heating sensation in treatments, but they told it was bearable with the treatment. Following treatments there was perifollicular erythema, which were the clinical end-point of the treatment and were reported as having disappeared within 10 hours. Long-term side effects such as hyperpigmentation, hypopigmentation or skin atrophy were not reported. In the modern world, the pursuit of ideality leads to the fact that unwanted hair on the body becomes not only uncomfortable, but also completely undesirable. In order to get rid of them, patients use a variety of methods, such as: depilation, shaving, wax, as well as depilation cream. Common methods of hair removal have only temporary effect, which makes patients constantly spend money, time and think about this problem. For a long time, laser hair removal takes the leading position in the world of modern noninvasive procedures. This procedure is practically painless, long-lasting and effective. Alavi et al.3 reported the evidence of using hair removal laser safe and permanent in hair reduction. As well as significant positive effects on skin, including increased dermal density and decreased transepidermal water loss, which might be used in skin rejuvenation. The mechanism of laser hair removal process based on the ability of the laser to exert its influence by a beam of light that transforms into the heat energy that pass for 4 mm and absorbed by the pigment melanin. Light energy is converted into heat, heating the follicle and hair cells in order to destroy it completely. Various clinical studies in laser hair removal have been described in the literature.4–7 Royo et al.8 provided clinical assessment of 755-nm diode laser for hair removal. It was concluded that 755-nm diode laser may be a highly efficacious in hair removal, because of the high energy that can be safely applied in treatment of difficult cases. Whereas Brown,9 Pai et al.,10 Koo et al.11 describe dramatic decrease in therapy-related pain and good efficacy after the using of low fluencies at a high average power with a multiple pass in-motion of 810-nm diode lasers. The 808-nm diode laser is a fast, safe and painless diode platform that can be used to raise pulse repetition rates up to 20 Hz and manipulate a wide range of fluences, making it suitable for use on all skin and hair in the body and for rapid and efficient hair removal.12 Many studies have been reported about relationship of fluence, repetition rate and treatment effectiveness. Li et al.13 compared the safety and efficacy of different fluencies and repetition rates of using the 810 nm diode laser for axillary hair removal. It was concluded that a low fluence (10 J/cm2), high repetition rate (10 Hz) mode is more efficient method of laser hair removal with less treatment discomfort than high fluence (34–38 J/cm2), low repetition rate (10 Hz). Pai et al.10 compared two 810-nm diode laser machines having different fluencies and repetition rates by similar methods for facial hair removal. It was also concluded that a low fluence (10 J/cm2), high repetition rate (10 Hz) mode is more efficient with less pain than high fluence (25–35 J/cm2), low repetition rate (2 Hz). In our result, the overall mean reduction rates of thickness and density in both groups were slightly high in high fluence (Fig. 3, 4). In aspect of patient satisfaction, majority of patients were satisfied to treatment. Briefly 80% of patients respond ‘Excellent’ or ‘Very good’. Especially high fluence group’s percentage of ‘Excellent’ are higher than low fluence group (Fig. 2). In visual assessment by plastic surgeons, high fluence group’s score is higher than low fluence group. But there was no statistically significant difference. We think that is because enrolled patient numbers are small. Comparing with other study, remarkable finding is that parameter of ‘high’ fluence is much smaller than other comparison study. Theoretically, lowering the fluence is supposed to reduce pain due to the procedure and potential side effects. The pain generated from the procedure may be influenced by many factors, such as the laser parameters (fluence, wavelength and pulse duration), skin cooling, treatment site and the quantity and quality of hair. Rogachefsky et al.14 have reported that the pain was directly related to longer pulse duration and higher fluence, and complications were greatest at the highest pulse duration and fluence. But in our study, high fluence group’s pain score in our study is similar with other study’s low fluence group10,14 and there are no complications. Also other study’s low fluence treatment use multiple pass, but we use single pass technique. So we think our study’s high parameter has advantage of procedure’s comfortability in aspect of pain and time saving. We reduce the time comparing with other low fluence treatment by using single pass and get slightly better treatment effect than conventional low fluence treatment, with similar treatment comfortability. Further study with large number group will be necessary to verify significant difference. When comparing low fluence mode, high fluence mode (14 J/cm2) HR808 prototype diode laser can efficiently remove unwanted hair. Also this mode significantly improves comfortability and reduce treatment time when compared to other traditional low and high fluence mode diode laser. Fig. 1. Example of hair roots counting per cm2 on forearm, before and after the 4th treatment, based on images of folliscope finding. (A) Pretreatment folliscope finding of right forearm. (B) Visit #5 folliscope finding of right forearm. (C) Pretreatment folliscope finding of left forearm. (D) Visit #5 folliscope finding of left forearm. Fig. 2. Patient satisfaction. Percentage of responses are shown. Fig. 3. Forearm density and thickness change graphs. Data are shown as mean results. Fig. 4. Lower leg density and thickness change graphs. Data are shown as mean results. Gan, SD, and Graber, EM (2013). Laser hair removal: a review. Dermatol Surg. 39, 823-38. Al-Haddab, M, Al-Khawajah, N, Al-Ala’a, A, Al-Majed, H, Al-Shamlan, Y, and Al-Abdely, M (2017). The effect of waxing versus shaving on the efficacy of laser hair removal. Dermatol Surg. 43, 548-52. Alavi, S, Abolhasani, E, and Nilforoushzadeh, M (2016). Effects of hair removal alexandrite laser on biometric parameters of the skin. Lasers Med Sci. 31, 481-4. Ilknur, T, Biçak, MÜ, Eker, P, Ellidokuz, H, and Özkan, S (2010). Effects of the 810-nm diode laser on hair and on the biophysical properties of skin. J Cosmet Laser Ther. 12, 269-75. Wheeland, RG (2012). Permanent hair reduction with a home-use diode laser: safety and effectiveness 1 year after eight treatments. Lasers Surg Med. 44, 550-7. Wanitphakdeedecha, R, Thanomkitti, K, Sethabutra, P, Eimpunth, S, and Manuskiatti, W (2012). 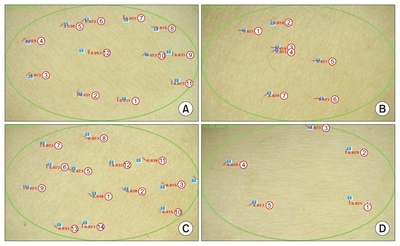 A split axilla comparison study of axillary hair removal with low fluence high repetition rate 810 nm diode laser vs. high fluence low repetition rate 1064 nm Nd:YAG laser. J Eur Acad Dermatol Venereol. 26, 1133-6. Barolet, D (2012). Low fluence-high repetition rate diode laser hair removal 12-month evaluation: reducing pain and risks while keeping clinical efficacy. Lasers Surg Med. 44, 277-81. Royo, J, Moreno-Moraga, J, and Trelles, MA (2017). Clinical assessment of a new 755 nm diode laser for hair removal: efficacy, safety and practicality in 56 patients. Lasers Surg Med. 49, 355-60. Brown, M (2009). Permanent laser hair removal with low fluence high repetition rate 810 nm diode laser--a split leg comparison study. J Drugs Dermatol. 8S, s14-7. Pai, GS, Bhat, PS, Mallya, H, and Gold, M (2011). Safety and efficacy of low-fluence, high-repetition rate versus high fluence, low repetition rate 810-nm diode laser for permanent hair removal--a split-face comparison study. J Cosmet Laser Ther. 13, 134-7. Koo, B, Ball, K, Tremaine, AM, and Zachari, CB (2014). A comparison of two 810 diode lasers for hair removal: low fluence, multiple pass versus a high fluence, single pass technique. Lasers Surg Med. 46, 270-4. Agarwal, M, Velaskar, S, and Gold, MH (2016). Efficacy of a low fluence, high repetition rate 810nm diode laser for permanent hair reduction in Indian patients with skin types IV-VI. J Clin Aesthet Dermatol. 9, 29-33. Li, W, Liu, C, Chen, Z, Cai, L, Zhou, C, and Xu, Q (2016). Safety and efficacy of low fluence, high repetition rate versus high fluence, low repetition rate 810-nm diode laser for axillary hair removal in Chinese women. J Cosmet Laser Ther. 18, 393-6. Rogachefsky, AS, Silapunt, S, and Goldberg, DJ (2002). Evaluation of a new super-long-pulsed 810 nm diode laser for the removal of unwanted hair: the concept of thermal damage time. Dermatol Surg. 28, 410-4.